The 2011 French Canadian comedy, Starbuck, has been recreated into an American version for those too lazy to read subtitles. It's basically the exact same movie, only the language and actors have been changed. Using the same director, Ken Scott who wrote the script with Martin Petit it's a mirror image of the original which was funny and refreshing. In this remake there's just something lost in translation. 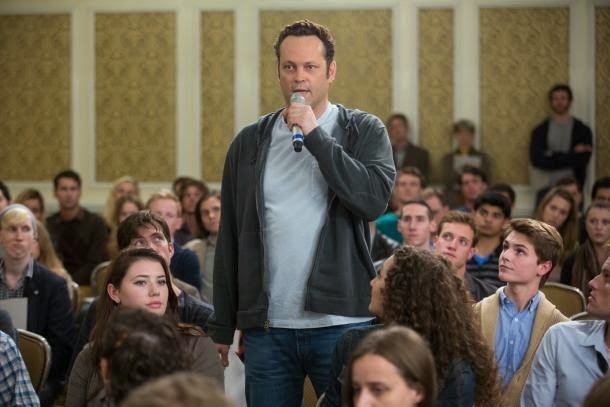 Vince Vaughn who usually always plays Vince Vaughn has subdued himself somewhat as David Wozniak, the son of a butcher who works as their delivery driver. It's a job that he can't seem to do well. He's a dreamer and a loser. His newest project is growing hydroponic pot. He's trying to get out of an $80,000 debt to some loan sharks on an ill fated investment. On top of that his sometime girlfriend Emma (Cobie Smulders) has revealed she is pregnant and is going to keep the baby to raise on her own. One night he comes home to the news that his donations to a sperm bank years ago had fathered 533 children. A large group of them had decided to petition the court for the clinic to reveal the identity of the donor labeled “Starbuck”. Seeking advice from his best friend lawyer Brett (Chris Pratt) who has to reapply to get his license to fight the lawsuit. They are given a folder of the 142 young adults who seeking to find him. Brett says “don't open the envelope”. Of course he does. One by one he tracks down a few of the names who just happen to live in the same town. He sort of stalks them, and then perform random acts of kindness. Helping a OD'd young woman, helping a street performer, giving a waiter a chance to audition for a role of the lifetime, stopping construction workers from oogling a beautiful girl. He even visits and spends time with a young man who is institutionalized for an extreme handicap. One day while following one of kids he ends up in a roomful of his off spring who are gathered to talk about the lawsuit. He ends up breaking a date with his girlfriend to attend a weekend camping trip with the united siblings. Unfortunately his looming debt has put his family in danger. He's forced to counter sue for the monetary reward. Emma had encouraged David to make something of himself if he wants to be part of their child's life. He sees coming forward with the truth to be part of his growth and his ability to become a suitable father. There was something more believable of Patrick Huard who played David in the Canadian version. He was more dishevelled, sincere and heartfelt. As much as Vince Vaughn toned down his fast talking slub of a character, you can't help but still see Vince Vaughn, especially since he towers over everyone height-wise. The premise is somewhat far fetched, but can be amusing. In fact, the success of Starbuck has spurred a French remake called Fonzy. So get over your phobia of subtitles and rent the original.